In a letter to fans on their website, Vision Racing expresses "..Profound regret and heavy hearts.." as the team fell due to lack of sponsorship for the upcoming 2010. The shuttering of Vision Racing leads to a further fall from grace of Tony George, a man who started and ended the 13 year old conflict resulting in two open wheel series vying for acceptance in North America. The closure of the team also risks removing George's stepson and driver Ed Carpenter from the series' full-time roster for the first time since 2003. Founded on the assets of Kelly Racing, the Tony George-owned IndyCar team never found victory lane in his own series. However, 2009 saw Vision Racing drivers Ryan Hunter-Reay score a 2nd place finish on season opening street course round in St Petersburg. 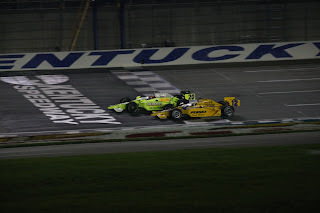 Long time team driver Ed Carpenter was able to match the team's best finish at Kentucky, a career-best run for the 6 seasons in competition.